WASHINGTON, DC — I, along with three other young professionals and my BJF colleague Lauren Klinner, am at the American Israel Public Affairs Committee Policy Conference. Though this is my eighth conference to attend since first going to college, I’m here with three others who are experiencing their first Policy Conference through the Mitnick Fellowship fund in the Birmingham Jewish Foundation. 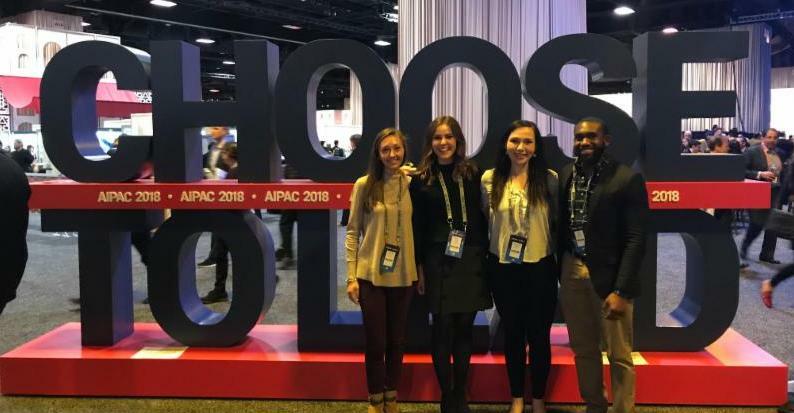 Much like seeing Israel through a first timer’s eyes, going to AIPAC’s Policy Conference with people who have never been is eye-opening and reminds you of the magic of your first time. There’s truly nothing like being in a room with 18,000 other people who feel as strongly and positively about Israel and its relationship with the US. This year’s conference has been focused heavily on the bipartisan efforts of AIPAC. While AIPAC has always been a bipartisan organization, the political climate of the past two years has provided a challenge for them. In a time when everything is so polarized, it’s hard to meet in the middle. But AIPAC manages to facilitate that middle ground that allows all of us — Jews, Christians, Hispanics, African-Americans, conservatives, progressives, etc. — to express our love for Israel and move the relationship between the Jewish State and our country forward. Since the conference started Sunday, I’ve been thinking a lot about unity and disunity. We know that as a Jewish community what unifies us is our traditions, our history and our sense of belonging to something bigger than ourselves. But it often feels like there is a lot that pulls us apart. Differing perspectives on politics, Israel and beliefs within the Jewish community have the potential to fracture us. Or so I thought until I witnessed a conversation between Natan Sharansky, a former Soviet refusenik and political prisoner, and his daughter. Sharansky, who was able to leave the Soviet Union in the 1980s for Israel, has become a hero to many worldwide for his courage and faith. Since arriving in Israel he has been involved in politics, served as a Cabinet minister, and most recently has served as head of the Federation-funded Jewish Agency for Israel. Sharansky’s daughter started the conversation explaining that she felt that the issue of rescuing Jews from the Soviet Union was an easy issue for all Jews to get behind. Of course the Jews in the Soviet Union needed to be saved. How could there be any conflict surrounding this need? But, she went on to ask her father, how does his experience of being so united with his community around freeing Soviet Jewry relate to today’s generation of younger Jews who have so many issues to consider when it comes to the Jewish community? He chuckled at her assumption that saving Soviet Jewry was “an easy” issue to get behind. So many Jewish groups fought for the freedom of the Soviet Jews, yes, but, Sharansky argued, those groups were in constant conflict on how that should happen, when it should happen and where those Jews should go once they were freed. Some groups had an interest in taking Soviet Jews to Israel, others wanted the first priority to be providing Jewish education and some felt that the newly-freed Jews should move to the US. What Sharansky said made me rethink my frustration about our Jewish community too often being disunited. His words made me realize that what we perceive of as disunity actually can be healthy — and a reflection of how much we all care even though we sometimes disagree. “Our unity was not different than your disunity,” he explained. A light-bulb went off in his daughter’s head. “The disunity IS the unity,” she said. I had the same light-bulb moment. Yep, that’s it. His daughter went on to talk about the arguments her family would have at the Shabbat table. They were united in their conversation, but not in agreement about the various topics that were broached each Friday night. Isn’t this what we as Jews are all about? Questioning, answering and questioning some more? So, yes, in a sense, our disunity is our unity. Each perspective that every member of our community has a very important role and impacts how the Jewish world moves forward. We may each have our own interests and, let’s be honest, very strong opinions, but each of those contributes to us as a people. Click for more on AIPAC Policy Conference.